The Aymara are members of a tribe of Native Americans that live in Bolivia and Peru. They are native to the area around Lake Titicaca. They speak the Aymara language. They call themselves Aymaras. The president of Bolivia, Evo Morales, is Aymara. 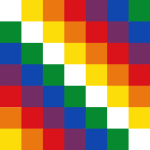 The many-colored flag of the tribe is called the Wiphala. This page was last changed on 5 July 2013, at 12:23.